"In Hollywood films, repetitions of situations or lines of dialogue tend to measure an arc of progress or degree of development. Art cinema tends to use repetition to establish mundane routine, to suggest psychological states eddying underneath behavior, and to create symbolic parallels. Wong Kar-wai’s repetitions often fulfill these functions. With To and Wai, repetition is used as an almost mechanical device, rhyming characters, bits of business, and settings in ways that suggest a closed world ruled by rather narrow laws [...] The tendency toward mechanical, somewhat absurd repetition of action, tics, and props goes along with another method for tightening the plot. To and Wai turn from the Hong Kong episodic norm by creating more intricate chains of action than other local filmmakers attempt. But instead of relying on character development, they devise schemes—plans, usually devious, that central characters put into motion. In To’s plots,characters plot." John Wick, a Keanu Reeves-starring revenge thriller developed by Chris Stahleski and David Leitch (responsible for 2012's The Package), features only two scenes of elongated fabula, where a character explains motivations, backgrounds, or other details that usually create the theme of a film. While I doubt if Wick's screenwriter Derek Kolstad has even heard of Milkyway Image (he cites The Raid in an interview), the film's screenplay can't help by recall Johnnie To's motto to "leave blank spaces" (liú kōng) and have audiences fill in the edges of the minimal exposition. While the simplicity of the plot (a standard revenge tale, which sadly involves the death of a poor puppy) is miles behind the complexity of To and producer Wai Ka Fai, John Wick doesn't follow the rules of the way Hollywood tells it, and instead relies on inference. I understand why my colleague Vadim Rizov could see the various schemas built by Kolstad's screenplay to be in service of some cinematic building universe scheme in the Marvel, but the construction of the dialogue never emphasizes these points: no character ever explains what a gold coin is nor the "dinner reservations" hot line. Or it is better to say, these narrative events only make sense as plot elements as they are happening in the moment. The relationship between Reeves and Willem Dafoe's hit men follows a similar schema: their background is left ambiguous, and Dafoe's motivations via his two "helping hands" only make sense via an inference pattern based on previous information. Additionally, the latter of these two scenes works as both narrative surprise and payoff as built on the previous scene—there is no set up or even hint of a set up. When Dafoe later returns in a scene with Main Baddie Michael Nyquist, there is never any forced explanation of how Nyquist jumped from Assumption A to Conclusion B. This isn't completely in the realm of Milkeyway Image's even more didactic elliptical storytelling, but it's getting closer to a terse style of dialogue that minimizes any forced exposition. John Wick, however, is primarily an action film, and thus has been rightfully praised for the film's intensely choreographed and brutally graphic violence. As both Ben Sachs and Stephanie Zacharek have eloquently elucidated, the action sequences rely on a series of steady long takes in carefully choreographed minimalist spaces (not abstract, but clear lines, backgrounds, and diagonals) with enough distance by the camera to capture the movements while never diluting their visceral impact. But there's more to Wick, however, and it isn't that the film build some relationship to ballet as many action films are now compared to. In fact, what makes the film both brutal but also stunning is the specificity to the sequences. Wick treats each bullet like a part of the physical matter. Men aren't just shot—they are hit in the arm, a leg, or a head. Reeves actually holds and aims a gun, so that there is a clear visual eye-line created between the aim of the weapon and the eventual entry point of every bullet, and most random baddies require multiple shots in a variation of bodily locales to actually sedate them. And then there's the reloading, which is constantly happening throughout the film, even made into one of the film's funniest jokes during the Red Circle sequence. 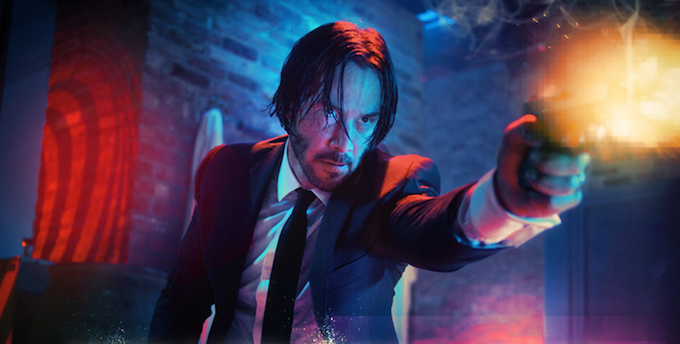 John Wick thus slowly plays between its more expressionist functions—lush, saturated colors that reflect into the film's over-accentuated drama—and its realist attitude of relating each body on screen to a physical presence, while also implementing the film's coded language to avoid any forced awareness of the narrative schemas at play. This is all to say, John Wick treats violence in a way different from To's movies and instead via the same way the titular protagonist does so: violence is violece, which is both an amoral and essential act.